The Nest E is the latest thermostat from Nest and it might be the right fit you have been looking for. It comes at a lower price point, but it’s lacking some of the features of the Nest 3rd Gen. We got our hands on both of them so we could compare Nest vs Nest E and found 10 main differences between both thermostats. Let’s dive in and see which one would be best for you. 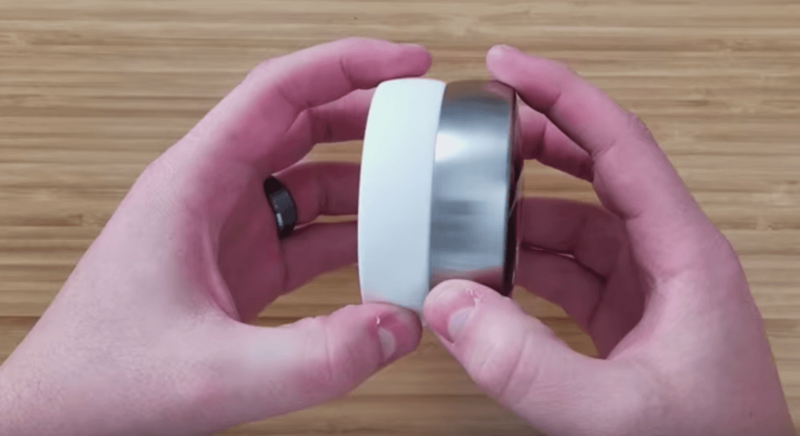 In the video, we go over the main differences between each smart thermostat, but there are actually quite a few similarities as well. Read on for more information about all of the same and different features of both Nest vs Nest E.
1.4 Which Wire Contacts Do I Need? 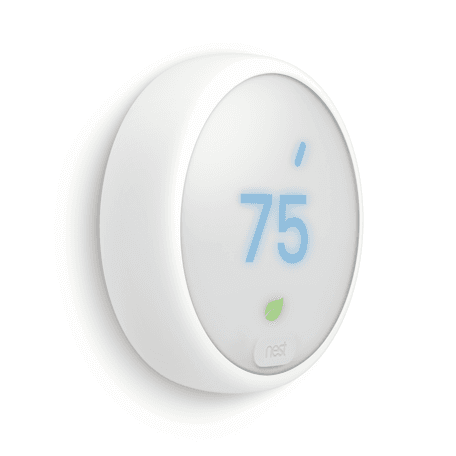 Both thermostats between Nest E and Nest Learning have quite a few features in common. This is a good thing because the Nest E has most of the great features of Nest 3rd Gen, at a lower price point. Same app, although Nest E has a slightly different app design to match its look. With either Nest Learning or Nest E, you’ll use the same Nest app to control your thermostat. This app is easy to use. Same features: scheduling, motion detection, remote access, and notifications. The thermostats mostly work the same. Learn your habits to automatically adjust the temperature. 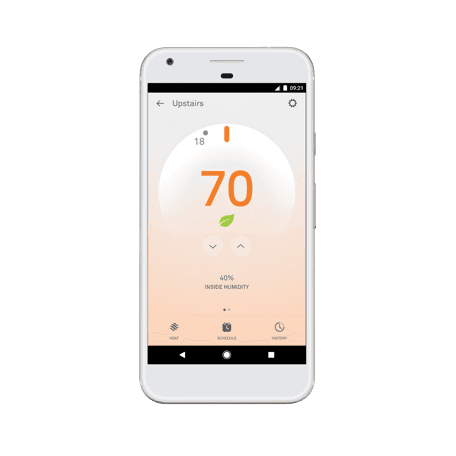 During the first few weeks with Nest or Nest E, these thermostats track when you come and go, in addition to your temperature preferences, to learn your preferences and automatically adjust, saving you energy and money. Both offer Family Accounts, giving multiple users control of the same thermostat. Nest can also automatically adjust the temperature based on who is home using this feature. Energy-saving programs can save the environment and your bill from heating up. Nest partners with plenty of local utility companies to help their customers receive rebates. There are also programs like Time of Use savings, which turn down your Nest during peak pricing hours to save you money. Nest also saves you energy by making tiny adjustments to reduce your overall usage. The Works with Nest system allows both thermostats to be compatible with a variety of smart home devices, including other Nest products like Nest Protect and Nest Cam. This makes it easier to automate your home. When you leave and secure your smart lock, it can trigger Nest to adjust the temperature for away mode. Similar size and iconic round shape. While they have different looks, each thermostat has the same basic design and takes up the same amount of space on your wall. 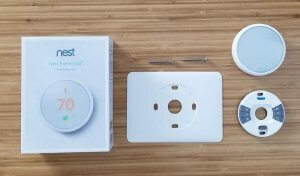 You can see us hold both thermostats Nest vs Nest E next to each other in the image below. Easy controls. Adjust either thermostat by twisting the active ring on the outside of the thermostat. Turn to the right to turn the temperature up, or the left to turn it down. Easy mounting system with a built-in level. Installing either Nest thermostat is the same process. It’s not too complicated, although all HVAC systems are different and in some cases it makes sense to hire a professional. Screens turn on for either Nest when you walk right in front of it. This proximity sensor allows you to see the temperature at a glance without requiring any physical controls. No external sensors included for monitoring the temperature in other rooms. For this, you’ll want to purchase external sensors, or look into competitors like Ecobee3 or Ecobee4. When you think of Nest thermostats, the Nest gen 3 is likely what comes to mind. It’s extremely high quality and looks both smart and expensive. It will cost you more than Nest E, and here’s 10 differences between Nest vs Nest E that come if you’ll spend the extra money. Stainless steel, traditional Nest look. Nest 3rd gen (AKA Nest Learning Thermostat) looks more expensive and high quality. Crystal clear display. It’s hard to imagine this screen being more beautiful. Farsight technology available. This can see you across the room (up to 20 feet away) and illuminate with an analog/digital clock, weather forecasts, target temperature, and the current temperature. You can customize what you want the thermostat to display, and it can basically double as a cool looking wall clock. Available in a variety of colors: white, copper, black, and stainless steel. Metal ring. When looking at Nest E vs Nest Learning, the Nest 3rd gen Learning Thermostat is heavier and feels more high quality. More expensive. Sure, Nest gen 3 is more high quality, but you’re paying for it. In the end, your own budget and preferences will determine whether or not this is worth it to you. Comes with additional metal plate and a screwdriver for easier setup. Missing a pre-set schedule. You can manually add a schedule or just have it learn your habits. When comparing Nest vs Nest E, the newer Nest E is like a “lite” version of the Nest 3rd gen. It costs less (see the current price here) but also takes a way a few features. At first glance, this list of differences in the Nest E may look like it’s overwhelmingly worse than Nest gen 3. However, when you really factor in cost, most of these are not that big of a deal. Frosted film that goes over traditional display makes the thermostat minimalist and modern, but possibly a little cheaper looking. The screen is gray when it’s off and gives it a softer look, helping it blend into the wall. Not the clearest display. Frosted glass causes the screen to be blurry when viewed from the sides instead of straight on. No Farsight available, so the display can’t be changed. 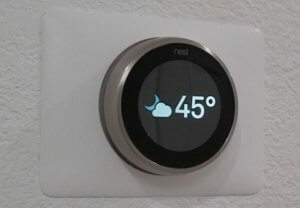 This is the biggest software difference that is missing in the Nest E. It displays the target temperature, with the current temperature above it. Lower resolution display: 1.76 inch diameter, 320×320, 182 PPI. We are marking this down a bit because at an angle it makes the text a little foggy. Only available in white. If you like the white then this isn’t a bad thing, but if you aren’t a fan of the new look then it could be a deal breaker since no other colors are offered. Cheaper plastic ring. The Nest E is a noticeably lighter, cheaper-feeling thermostat, and its plastic ring is a big part of that. More affordable– this is a big plus. Nest E is about $80 cheaper than Nest 3rd gen, which offsets most negatives in this comparison. Does not come with a screwdriver, so you’ll have to use your own during setup. This is not really a deal breaker for most people. Fewer wire contacts (6 instead of 10), but still compatible with 85% of homes. The reduced number of wire contacts helps keep the cost down, while still offering compatibility with most HVAC systems. Comes with a pre-set schedule, or you can set it to learn your habits. Nest heard the feedback about Nest 3rd gen Learning Thermostat and decided to add a pre-set schedule to make the initial weeks of using Nest a little easier and more straightforward. Which Wire Contacts Do I Need? Since one of the key differences between Nest vs Nest E is the number of wire contacts, you’ll want to take a look at your current thermostat’s setup before determining which Nest thermostat to purchase. Remove the thermostat from the wall: it might unscrew or simply pop off from the wall. Then you can use Nest’s compatibility checker to figure out if Nest thermostats will work with your system. In the compatibility checker, just select the connected wires on your thermostat and Nest will give you all of the information you need. Since Nest E only has 6 wire contacts compared to Nest 3rd gen, it’s compatible with slightly less HVAC systems, which is why you want to use the compatibility checker before purchasing either thermostat. When we tested out both of these thermostats, it was hard to pick one we liked more. They both have a high quality feel when turning the ring. This was the most surprising thing because the Nest E’s ring is plastic but it still felt nice and worked well. The biggest differences were in the design, and the lack of Farsight. If you like the design and don’t mind giving up Farsight, then Nest E will save you some cash. Unboxing the Nest E and Nest 3rd Gen was very similar. The main difference is that the 3rd Gen has a screwdriver and a metal backplate included in the box. Most people won’t need the metal plate or the screwdriver. If you are handy enough to install the Nest yourself and you don’t already have a screwdriver, then something strange is going on. If you currently have a Nest thermostat and are looking to replace your second thermostat in the house, then you may be debating which one to get between Nest vs Nest E. After using both, it’s safe to say the Nest E is a great second thermostat if you already have a Nest. Getting a second smart thermostat can be hard to justify, but the price of Nest E is great for adding another. The only thing to note is the menu on Nest E is slightly different than the Nest, which can make it difficult to navigate both thermostats during day-to-day life. Not a big deal, but a learning curve to be aware of. The Nest 3rd Gen has one big feature over the Nest E and that’s Farsight. Yes, both of the thermostats turn on when walking up to them thanks to their proximity sensor, but Farsight is much more than that. With Farsight, you have more control of what is displayed when you walk up to your thermostat. If you get bored of looking at the set temperature all the time, you can switch it up with a clock or the weather. One of the biggest advantages we liked about Farsight was the ability to see the current temperature in the house in a large font when walking by. The Nest E shows the set temperature in a large font and the current temperature in a small font at the top. The Nest E’s display is set and can’t be changed. But Farsight isn’t perfect either: when the clock or the weather are selected the temperature isn’t displayed until you click or twist the ring. This was slightly annoying, which is why I opted for the current indoor temperature on my thermostat. If we had to choose from Nest vs Nest E and keep one, it would be the Nest 3rd Gen Learning Thermostat. The text on it was crisper and easier to read, and the thermostat overall feels high quality. Being able to change the displays to show exactly what we want is also a big plus. But we also liked the simplicity and minimalism of Nest E, so it was a hard decision. The Nest E is great if you’re looking for a budget option that blends in while still looking smart. It’s a very high-quality thermostat that won’t disappoint, especially for its price. 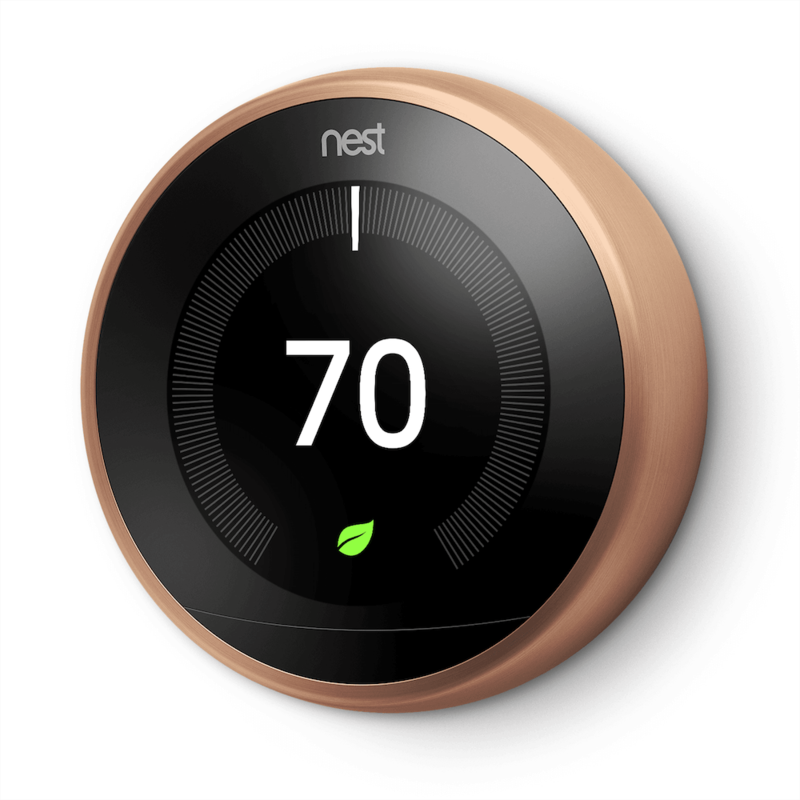 It’s definitely encouraging that Nest, Ecobee, and others are creating affordable smart thermostats to make smart home tech more accessible. Those who want advanced features like Farsight technology or unique colors can pay a little more for the 3rd gen version, but otherwise the cheaper Nest E is great for saving your cash. Is Nest is worth it? Which Nest do you prefer between Nest vs Nest E? Are you for or against the frosted glass? Let us know in the comments below.